What’s the difference between a Minke whale and Grey whale, or a porpoise and a dolphin? Tiny teeth, migration distance and one blowhole versus two are just some of them. 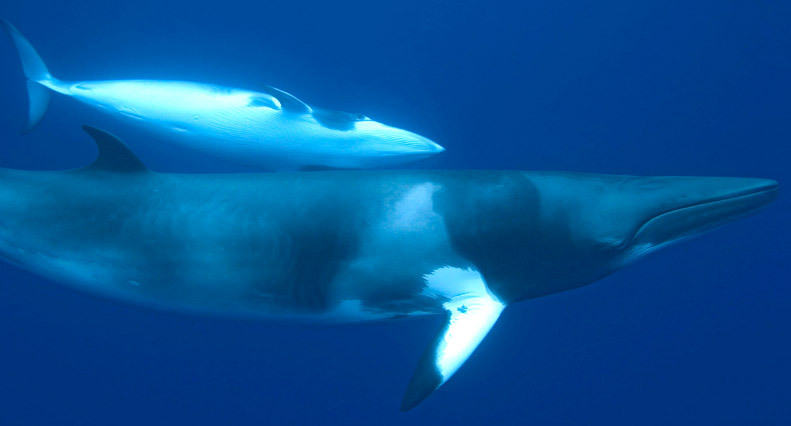 Minke whales are the second smallest species of baleen whale, with the pygmy right whale taking the number one spot. Minke whales have a slender torpedo shape, with a very triangular shaped head. They have very small dorsal fins that hook sharply backwards. Minkes average 8 to 9m (26-30 feet) in length and weigh 8-10 tons. Their baleen plates which they use to filter-feed small prey such as krill, herring and sand lance, measures 30 cm (12 inches) in length. They are dark coloured on their dorsal side and white on their ventral side. The subspecies that occupies the North Pacific is unique in having a white band on their short pectoral fins. Minke whales have been nick-named ʻStinky-Minkyʻ because of the foul odour that hangs in the air after they exhale. On calm days, you can often smell a minke before you see one. They are typically a boat-shy species that do not display many above water behaviors like breaching and spy-hopping. Minkes tend to stay in offshore locations, but the food-rich waters at Hein Bank and Salmon Bank in Haro Strait attract minkes to our waters throughout the year. Minkes are known to be curious about other species of marine mammals. They have been seen playing with resident orca in Haro Strait on several occasions. This shows that minkes can distinguish between the harmless fish-eating orca and the mammal- hunting or transient orca who will occasionally hunt minke whales. Because of their small size, they were not heavily targeted during the whaling era until larger baleen whale stalks were severely depleted. Minke whales are now hunted in Antarctic waters by the Japanese and in the Atlantic Ocean by Norwegian whalers. Gray whales are a type of baleen whale who make North Pacific waters their home during spring and summer months. Gray whales have the longest migration of any marine mammal, traveling over 20,000km (12,500 miles) round trip on their annual migration from the Bering Sea to Mexico and back. 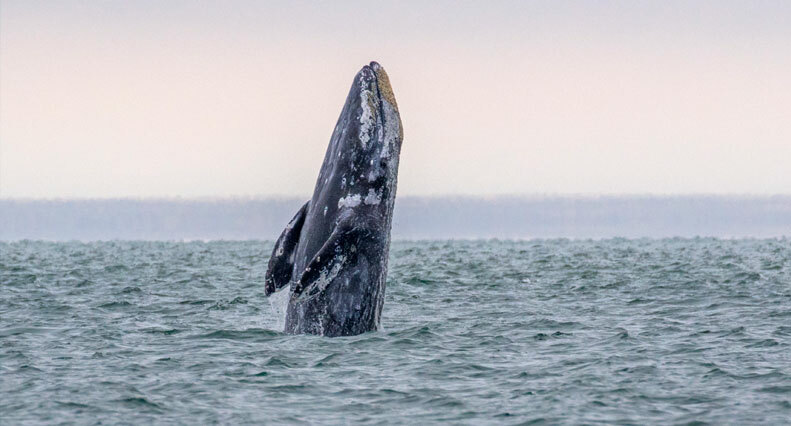 Gray whales like so many other species of mammals, fish and birds, feast on the rich blooms of plankton and fish eggs in the cold northern Pacific Ocean. They then travel to warmer southern waters off the Baja Peninsula of Mexico to specific lagoons to give birth and mate. Gray whales are gray in colour and covered in patches of barnacles and whale lice. There are four species of barnacles that live on the skin of gray whales, with one species not found living on any other whale or substrate. The barnacles create unique patterns and scars on the whaleʼs back, which is how scientists and whale watchers identify individuals. They do not have a proper dorsal fin on their back, but a dorsal hump that is situated about 2/3 the way back, followed by about a dozen bumps. Their upper jaw overlaps the lower jaw, and the baleen inside their mouths measures 0.5 to 1m (1.5 to 2 feet) long. They can be identified from far away from their heart-shaped spouts of mist when they exhale. Gray whales are similar to humpbacks in length and weight, adults ranging from 14-15m (45-50 feet) long, and weighing 30 to 40 tons. Their powerful tail flukes are an impressive 3 to 4 m (10-12 feet) across. Gray whales differ from many other baleen whales by having only 2 to 5 throat grooves which allow the mouth cavity to expand and take in large quantities of seawater and food. The primary food sources for gray whales include small shrimp and other crustaceans, tube worms and plankton. Gray whales feed by using their head to sift up sand from the bottom and gulping in water, sand and food. The whale then uses its tongue to force out water and sand, catching food in their baleen sheets. Most gray whales prefer to use the right side of their head to sift up the substrate, making them ʻright-headedʼ. Gray whales typically dive for 4 to 7 minutes, but they can hold their breath longer if they need to. Gray whales tend not to be acrobatic while they are feeding in northern waters. Breaching, spy-hopping and chin-slapping are more common during the breeding season when they are socializing and attracting mates. They may live for 70 years, producing a calf every 2 years on average. Gray whales suffered heavily from whaling activities. The Atlantic Ocean population was completely wiped out and the Pacific population almost experienced the same fate. Due to protection laws for gray whales, especially on their calving and mating grounds, the North Pacific population is stabilizing. Re-population has not occurred in the Atlantic. It is a common mistake for people to assume that the words porpoise and dolphin are synonyms describing the same animals. In fact, porpoises and dolphins are two separate groups of cetaceans with many physical differences. To start, porpoises are much shorter and more muscular than dolphins, making them the fastest type of cetaceans in the world. Porpoises possess very flat and tiny teeth, while dolphins have large, conical teeth. The last major difference between the two has to do with the number of blow hole openings, porpoises having two nostrils like baleen whales and dolphins having one nostril like the toothed whales. Both groups of marine mammals are genetically unique and no known cross breeding occurs between porpoises and dolphins. Dallʼs Porpoises are often reported as baby orcas due to their black bodies with white patches on their sides, similar to killer whales. Dallʼs Porpoises also have a white triangle on their small dorsal fins, which makes them easy to distinguish from the Harbour Porpoise. They are fairly large with an average length of 2m or 7 feet. They can weigh anywhere between 90 and 136kg (200-300lbs). Another sure way to identify Dallʼs Porpoises is by their signature rooster-tail spray when they are swimming fast. They are known as the fastest cetaceans in the world, able to exceed 30 nautical miles an hour. They can live between 15 and 20 years. It is believed that there are two times when calving peaks, one between February and March and the other between July and August. Dallʼs Porpoises can be seen traveling in small to very large groups in both coastal and offshore locations from the Bering Sea to California. A population also exists off Japan where they are hunted for meat. They are most commonly seen in local waters from July to November. They are a curious species who enjoy riding the bows of passing boats. They will work together to herd small fish, and they will also consume squid. They in turn are on the menu for transient orcas who hunt marine mammals. The population of Dallʼs Porpoises in the North Pacific was once around 1 million animals. The population has been steadily declining, likely due to accidental deaths from being caught in fish nets, and declining food sources. The major declines in their population are a growing concern in both Canada and the United States. Porpoises are often confused with being the same animals as dolphins, but the two groups of marine mammals maintain significant differences. Porpoises are shorter, stockier animals with flat faces, as opposed to the curved beak of dolphins. Porpoises have two blow holes, whereas dolphins have one. Porpoises have tiny, flat teeth, very different from the large, conical teeth found in dolphins. Porpoise and dolphin species differ genetically and do not interbreed. Harbour Porpoises are the smallest cetacean on the Pacific coast, reaching 1.4 to 1.8m (4.5 to 5 feet) long, and weighing 45- 68kg (110- 150lbs). They are a mottled black and gray colour, sometimes having white undersides. Their dorsal fin is small and triangular. Harbour Porpoises are common from the Aleutian Islands south to California. In the winter much of the population heads to Prince William Sound, Alaska. They are most commonly seen around Victoria from May until July. They typically travel in small groups, but large gatherings are not uncommon. Harbour porpoises are shy and not known to ride the bows or wakes of boats. 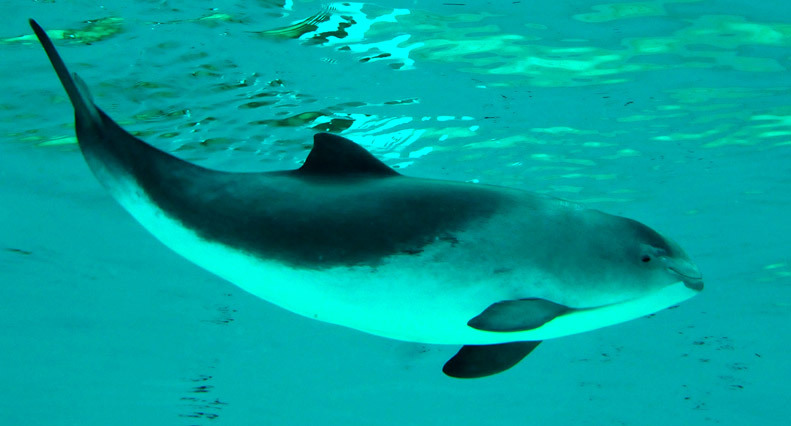 Harbour porpoises have a 10 to 11 month gestation period, giving birth to a single calf. When calves are born they will measure approximately 1m or 3 feet. Porpoises prefer smaller prey species such as fish and squid. The average lifespan of a Harbour Porpoise is 15 to 20 years. They share the same home range with Dallʼs Porpoises, and it is now evident that the two species interbreed. In 2011, a pregnant female hybrid was found washed up on San Juan Island, revealing that Harbour-Dallʼs hybrids are not sterile as previously assumed. The population of Harbour Porpoise is declining worldwide. The greatest threats to these shy marine mammals are being caught in fishing nets and toxic contamination from their food caused by human produced pollution. Though predation does not threaten the population, Harbour Porpoises are a prey species of transient or mammal- hunting orca. Although Pacific White-Sided Dolphins are not rare to southern Vancouver Island and Puget Sound, WA, they are seldom seen in the Strait of Juan de Fuca. Their range extends from the Aleutian Islands south down the Pacific coast. The population in the North Pacific numbers 30,000 to 50,000 individuals. Their bodies are black and gray with a large white stripe on their sides, the characteristic that gave name to the species. Like most dolphin species, Pacific White- Sided Dolphins have long, stream-lined bodies and a curved beak. Their large dorsal fin is two-toned in colour and curves backwards. A row of pointy, conical teeth on both their upper and lower jaws are useful for catching small fish and squid. Pacific White-Sided Dolphins are 2.1 to 2.4 m (7-8 feet) long, and weigh an average of 90-120 kg (200-300lbs). 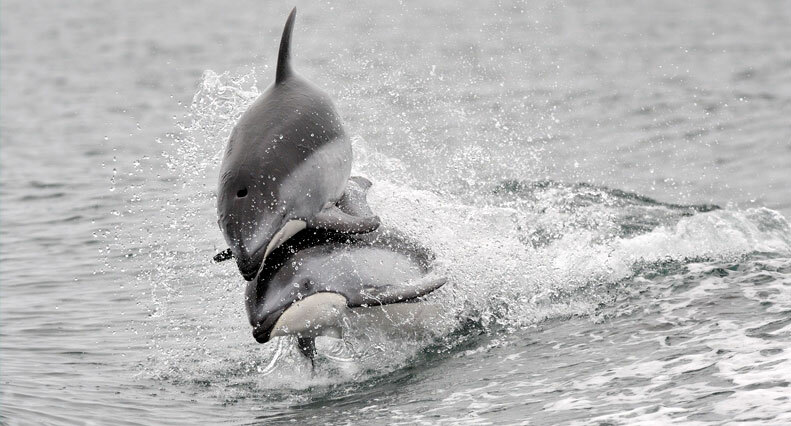 They are very acrobatic marine mammals, leaping out of the water as they swim, and ride the bows or wakes of boats. They are incredibly fast swimmers, an adaptation for catching fish and avoiding predators like killer whales. They can be seen in small groups to congregations of 1000 individuals. 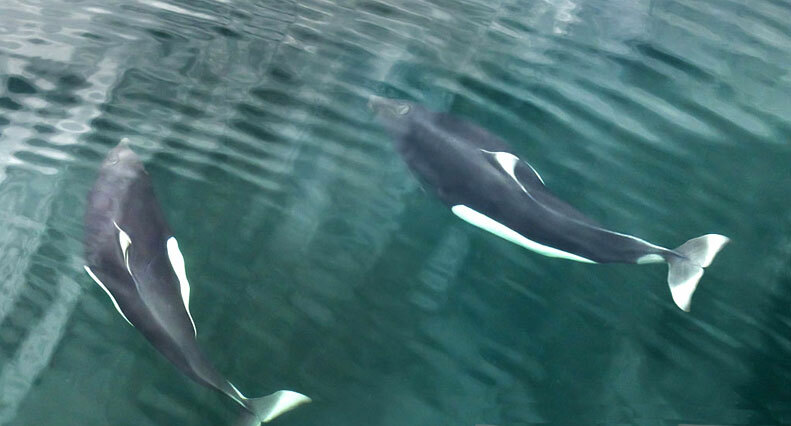 Pacific White- Sided Dolphins give birth to a single calf after a 9 month gestation period.